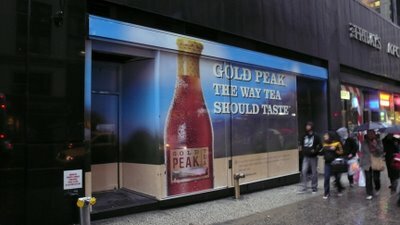 I found this InWindow advertisement today on 42nd street between Madison and Park avenue. I added it to the InWindow Google map, bringing the total to 6. This is a particularly small example and it still dwarfs pedestrians. A friend I was with brought up an important question after I took this picture. "Are empty storefronts better than these ads?" he asked, "Do they contribute to a sense of blight themselves and therefor pull our city further into recession and decay?" My immediate answer is empty storefronts are better, but a further explanation is in order. The idea that these InWindow ads cover blight and thwart neighborhood degeneration due to what is commonly referred to as "the broken window theory" is preposterous. This sociological theory was used to justify massive "cleanup" campaigns against inner city neighborhoods, which often resulted in the razing of entire well established social networks. The idea that a single broken window could lead to quick degeneration of entire areas of the city provided a cancerouse model of social decay, and one that warranted swift and decisive action. This theory has been highly criticized, partially because it has been used as a political tool to demolish instead of rebuild neighborhoods. In the case of InWindow, the giant illegal advertising billboards swap one form of blight for another. In doing so they do not solve this "broken window" concern, but rather allow corporate vandals to swoop in instead of grafitti artists. Aesthetically, they are arguably better, though a definitive answer to this argument would be hard to find. What isn't arguable is that they are illegal, and a result of a city ruled by corporate concerns over public interest.